When the invitation came in from Infiniti to test drive their FX50S, I wasn’t as enthusiastic as I should have been. The appeal of an SUV, much less one that is nowadays called a ‘crossover’, has always eluded me. Despite looking like they could, you cannot go off-roading in these. They are far too luxurious and spec’d differently from true dune bashers like the Land Cruiser and the Patrol. The luxury car segment is well covered by the likes of the S Class, the 7 series and the A8 and their ilk. If you wanted really spirited performance, you opted for a sports coupe. Where did a ‘crossover’ fit in to all this? The natural evolution of an enthusiast began, as I saw it, with a hot hatch or sport coupe. 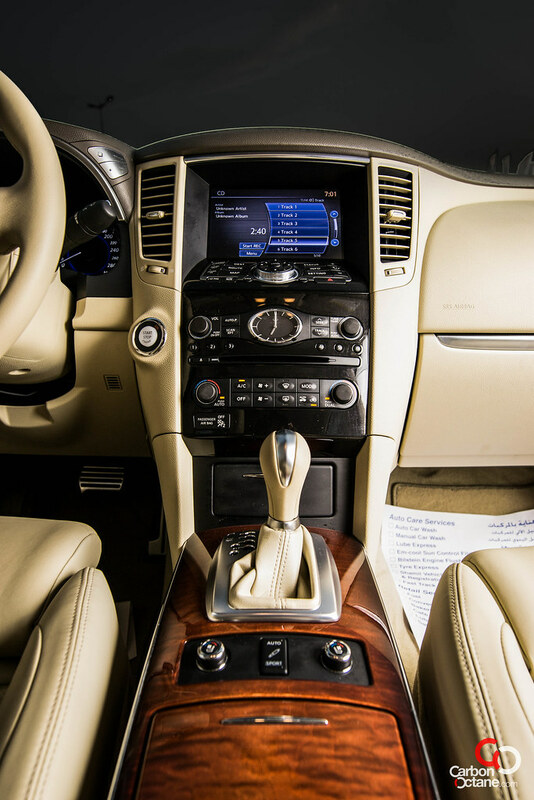 You put up with the limitation on passenger comfort until such time as the family started expanding. At which time, you moved on and got yourself a sport sedan. Once you began prioritizing bump-absorption over cornering ability, you started eyeing the luxury sedans. If going off-road kept you busy on weekends, your second car had to be a proper 4×4. The progression was simple and logical – until car manufacturers started creating and dividing classifications, expanding niches and sub niches and generally adding more flavors than Baskin Robbins could churn out in an inspired month. 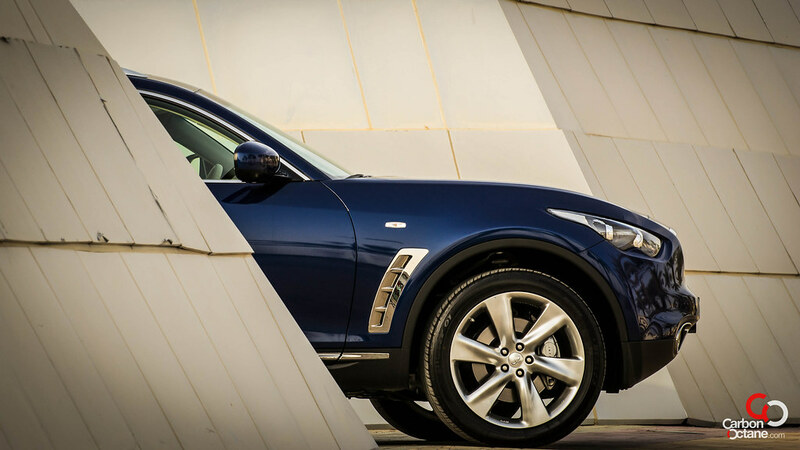 Hence the niche that we find foisted upon us today – the SUV/crossover. 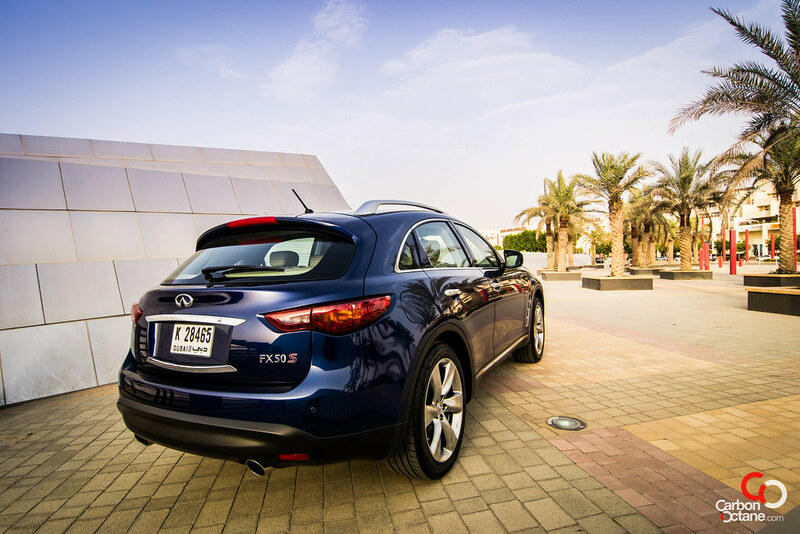 At first glance, the FX50S tends not to reveal too much and only members of the Infiniti fan club, if one exists, would readily differentiate it from its lesser variant the FX35. The standard 21-inch, 6 spoke aluminum alloy wheels wearing 265/45/21 tires look purposeful and give a subtle hint of the FX50S’s stated mission. The looks are a matter of personal taste and one that takes some warming up to for most people. Others love it at first sight. I had a colleague drawing similarities to a shark – a Great White, not the benign sort zipping around in aquariums the world over, destined only to scare the hordes of school children gaping through plexi-glass. Viewed from an angle for a sufficient period of time, I could visualize the FX50S’s maw casting a predatory shape. The gills just aft of the front wheel arches only go further in conjuring up the illusion. Funky headlights with Adaptive Front lighting System (AFS) and auto-leveling headlights do a marvelous job of lighting around the corner when negotiating ramps in the parking block. The overall design and size of the FX range conveys pep with none of the bulk that accompanies most SUVs. The first indication of this machine’s seriousness is when you thumb the starter button and hear the V8 rumble. Easing out of the car park, the visibility is good to the front and sides although the rear window is rather slim, enforced no doubt by the swoopy design. You realize that you are sat at lever higher than a normal sedan (naturally!) but much lower than the big off roaders. The way the revs pick up from low speed is quite extraordinary and sounds very different to some American V8s that pause mid stride to clear its throat. The 5.0 litre V8 throws out 390bhp at 6,500 rpm and 50.98 kg-m of torque at a relatively low 4,400 rpm. A Double Overhead Camshaft layout, with 4 valves per cylinder and CVTVCS (Continuously Variable valve Timing Control System) help explain the urge for quick revs. 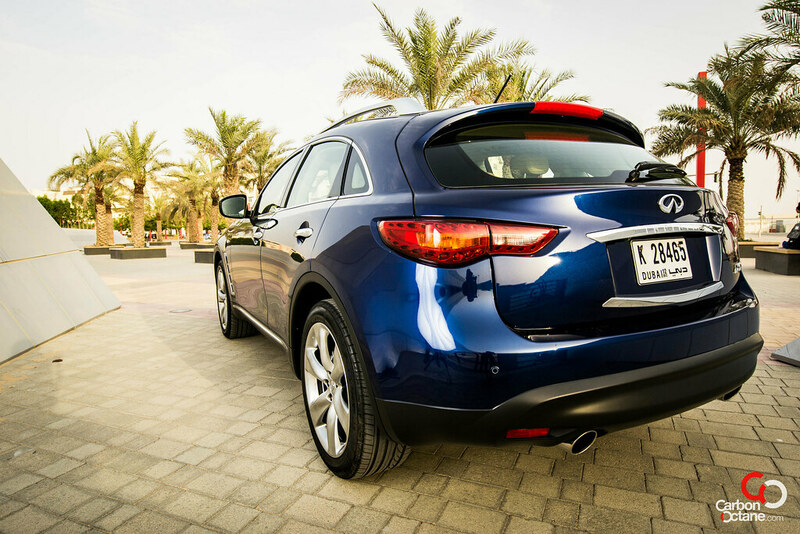 Independent shock absorbers at each corner coupled with stabilizer bars help channel the power on to the road. Huge, vented 4-piston discs, 355mm front and 350mm bite hard when you step on the brake. Perhaps I could get to like this machine more if I stopped thinking ‘Sport Utility Vehicle’ and just concentrated on the ‘sport’ aspect? The ‘sports’ connection comes from decidedly sport underpinnings donated by the Nissan 370Z. This is apparent in handling that belies something with a high center of gravity. Getting on to an exit ramp, I was gently piling on the revs when I could feel the power beginning to overpower the chassis. Chuckling mentally at having been proved right about the crossover’s limitations, I glanced at the speedo – and recoiled in shock to note that I was doing speeds I wouldn’t consider doing in some hatchbacks! The engine note was hardly strained at this point and I had misread the road speed. This was a common theme I would come across on many more occasions over the test period. While cruising on the highway at legal speeds, the engine is barely buzzing and you are lulled into a false sense of the lack of speed. Step on the gas and you realize the apparent lethargy while cruising was an illusion created to mollycoddle you. Merging on to highway traffic, an indiscreet prod of the throttle generates a ‘whoa!’ moment followed by a quick dab on the brakes as you realize you have covered more distance than intended . 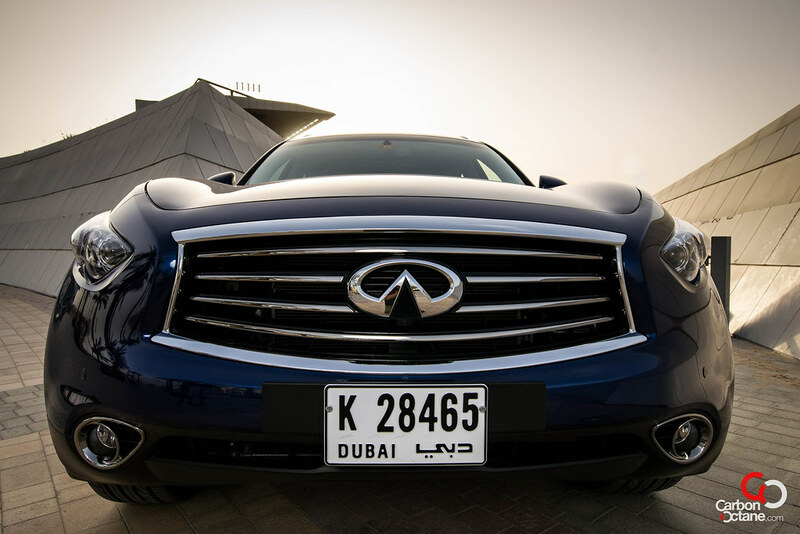 Infiniti claim a 0-100 km acceleration of 5.8 seconds. Believe it. This machine doesn’t dawdle when you ask for speed! The engine note rises in symphony and you realize with some excitement and a little dismay that this machine’s potential is better explored on a test track where independent tests have seen the FX50S hold its own. On the inside, the layout is pleasant with nothing jumping out to grab attention. The steering wheel controls are laid out intelligently. The display screen works with a very simple control dial to bring up information for the radio, maps, service information, fuel consumption and among other things – tyre pressure: a very good thing to be abreast of, considering how quickly tyre pressure drops in the U.A.E summer. Also good is the air conditioner which does a good job of fighting very high temperatures outside. Even with the weather reading a scalding 44 degrees at noon, the FX50S was a cocoon of cool comfort. An incredibly clever feature is the Around View Monitor (AVM) which uses cameras slotted around the car to build a birds-eye view on to the display panel when reverse gear is selected. Parking woes can be banished with this one feature – which comes standard. The leather interior is soft and supple with vented seat backs for driver and passenger. 8-way power seat in the front including 2-way lumbar support for the driver coddle the front occupants while the rear seats feature 60/40 split folding seatbacks that provide access to the trunk. The driver’s seat does a nice trick of sliding back when the engine is switched off and remains there until the engine is restarted. 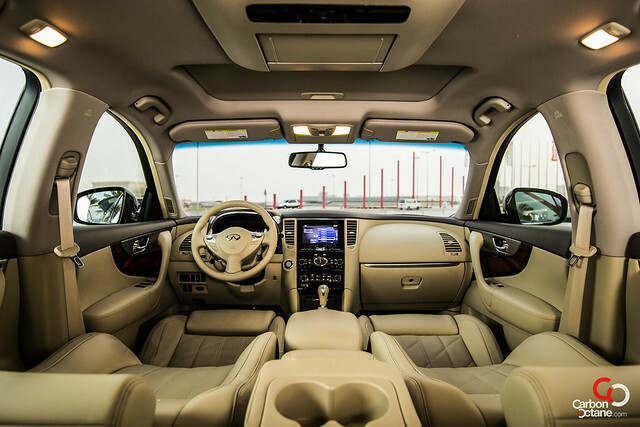 This helps ease of entry and exit for the driver, but makes the rear seat legroom look a little suspect with the front seat pulled right back. In the interest of objectivity, I bundled my 2 children in to the rear seat for a short drive. Both of them declared the seating ‘very spacious’. This should have convinced me but for the fact that my elder child is all of 8 years old and the younger one just 5. ‘Spacious’ can be construed a little generously at that age. Nonetheless the rear legroom is actually quite roomy with the front seat in position – unless you are gifted with an inseam length that dictates booking ‘first class’ when you fly. Those with an auditory disposition should be pleased to hear that a lovely 11-speaker Bose Premium sound system comes standard and includes MP3 playback besides AM/FM/CD. USB connection port for iPod® interface and other compatible devices also comes standard for those who haven’t purchased a CD from the music store in some time. A 9.3 GB Music Box hard drive should hold enough music to play every song by every artist you ever bothered to listen twice. 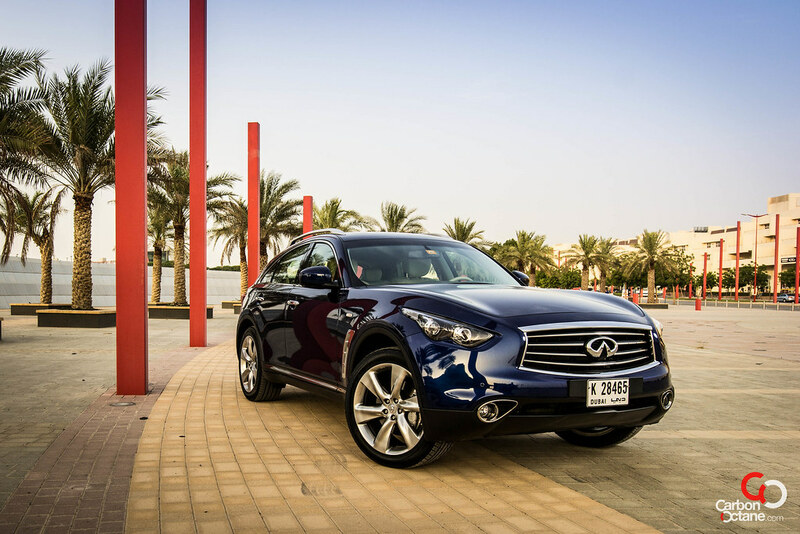 The FX50S retails for Dh 256,500 in the UAE, including full comprehensive insurance for the first year. Compared to most of its competition that is quite attractive. It has definitely made a believer out of me. More importantly it offers, for the motor-head just separated from his beloved sports car due to ‘family pressure’, a perfect tool to hoot around on when not playing devoted family man. I think I’m beginning to understand this ‘niche product’ concept a little better nowadays.